Branching is used to have respondents skip certain questions that are not relevant to them. This allows you to create different routes through your survey, guiding respondents based on their responses or profile. For example, you may have a number of questions about the respondents children. If the first question is ‘How many children do you have?‘ and the respondent indicates ‘none‘, then there is no reason to show that respondent the other children related questions. Just skip them to the next section. The respondent sees fewer questions and thus has a greater chance of reaching the end of the survey. Branching is page based. Meaning, after the respondent clicks on the ‘Next’ button at the bottom of the page, which page should the respondent see next? You can branch to question pages in your survey (1), the thank-you page (2), the alternative thank-you page (3) or a URL (4). The latter can be useful for branching to another survey, a website, etc. Click on the tab Surveys. Under each page is a Branching button . Click on it to open the branching window. When the branching window first opens, you see an option to add a branch (A) to the page and the optional Else branch (B), which allows you to optionally select a page where you want to send the respondent if he doesn’t fulfil the conditions of any of the other branches (or when there aren’t any other branches). To create a branch click on Add branch (A). A branch consists of one or more conditions. A condition is a set of criteria. If the criteria are met, then the condition is true. If the conditions of a branch are met then the branch is true and the respondent will be sent to the target page set in the branch. Select from the Go to dropdown(C) the target page where the respondents need to go when they met the condition(s) of the branch. Question – The answer on an earlier question. 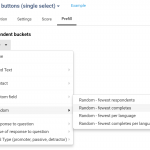 Respondent field – Data from the respondent (Socio-demographic, address data, custom fields, …). Select the type you want from the Type dropdown (E). Select from the Select question/field dropdown (F) the question or respondent field on which you want to base your condition. Depending on the context you have the choice of different operators to set different criteria like: “is”, “is not”, “contains”, “does not contain”, “greater than”, “less than”, etc. Choose an operator from the Select operator dropdown (G) to further complete your condition. 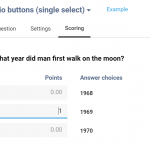 Choose an answer from the Select value dropdown (H) or fill in the text field that the condition needs to match. By clicking on Add condition (K) you can add as many extra conditions you want. Using the AND/OR-operator (L) you can indicate if some or all the conditions need to be matched. You can add extra branches by clicking on Add branch (A). Removing branches (I) or conditions can be done by clicking on the red crosses. Saving your branches can be done by clicking on the Save (M) button below in the window. After clicking on the save button and returning to the question edit page, below every page is an overview of the branches and condition(s). Click on the “Edit” link to edit your branch(es) and condition(s). First create all your questions and pages and only then add your branches. Make questions on which branches are based required. Branching is page based so questions that need to be skipped have to be on a separate page, not together with questions that don’t need to be skipped. If you do need to add questions or pages after having set branches, then check these branches carefully. Finally there are three important tips: test, test and test! Try all possible answer combinations until your are 100% sure that the branches are correct, before launching your survey. You will have to put Q18 on a different page, you can not have different conditions for questions on the same page. i am trying to delete the branching entirely as I know want to use the page logic but it’s not allowing me to. I can only delete the questions, not the “else go to” What am i missing? I forwarded your question to our support team. They’ll be happy to help you! Hi. I’m trying to find a survey software that can handle multiple branching: Can I make multiple branching on a question – branching from a multiple answer question to more than one other question? Example: Which modes of transport did you use for your journey? Possible answers being e.g. walk, bike, bus, train and car. E.g. if the respondent used bike and train she should be redirected to a page related to the bike part of the trip and also to the one about the train. Also can I redirect based on a text field being empty or not? Or a check box being checked or not? Sure you can. You can combine multiple conditions for a branching, and link these conditions either via an “and” or “or” operator. Your example does sound like it would be easier to do via page display logic (https://www.checkmarket.com/kb/what-is-page-display-logic/), though. That way you can just set up the logic so that the page related to the bike part of the trip is only shown when “bike” was selected in the question, etc. So I’d recommend that instead of branching in this particular example. And you can indeed also set a condition on a question being empty or not. Is there anyway to Branch at a question level? Example – If a user selects “Disagree / Strongly Disagree” or 0-5 on a 0-10 scale, a question appears just for that negative response? 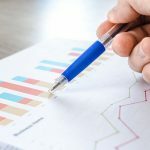 For rather long surveys, it is tedious to create a page for each negative response and makes the survey longer for end users who have multiple page branches because of a large number of negative responses. Yes, that’s possible. 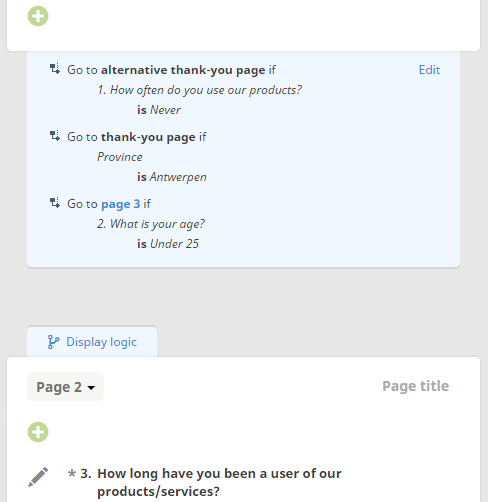 You can create just 1 page, with 1 open text question on why a respondent gave a negative score. You can then use page display logic to show that page when 1 of the previous rating scales had a low score. If you need assistance setting this up for a particular survey, you can always reach out to our Support Team. They’ll be glad to put you on the right track. I have not understood this survey,its logic is tricky. I’m sorry to hear you’re not managing the logic. I just had a look at your account, but don’t see a survey “in development”. What type of logic do you want exactly?